Every year it shows up in a different place. I never know quite where it will be or if it will "be" at all. Discovering the place where the previous year's ladybugs laid their eggs to hatch and transform the following spring is a mystery I've come to enjoy solving. The first year the ladybugs set up a nursery, it was within and under the canopy of the cherry tree and "the thicket". 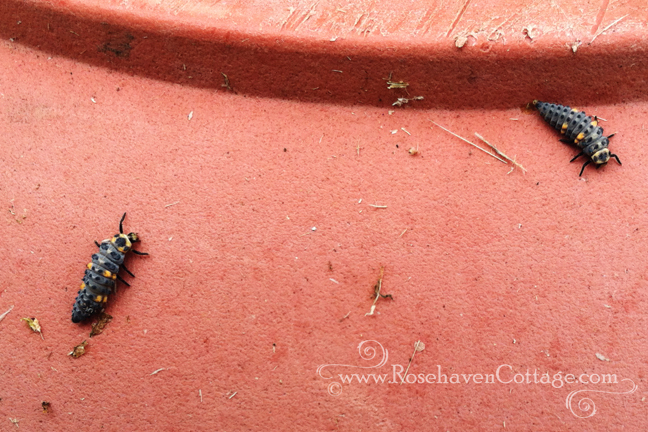 Another year, I found the newly transformed ladybugs in the pots of lavender crawling around enjoying the blooms. Last year they were housed in a thick stand of dandelions against the deck. Today, I discovered that this year the nursery is in a patch of spring grasses and wild geraniums I let grow until late last week when I went in with the weed whacker and took the height down to about 4-5" so it wasn't such a jungle. I'm glad I didn't go in and cut everything off to the ground or I would have destroyed the ladybug nursery without knowing it until it was too late. Whew! 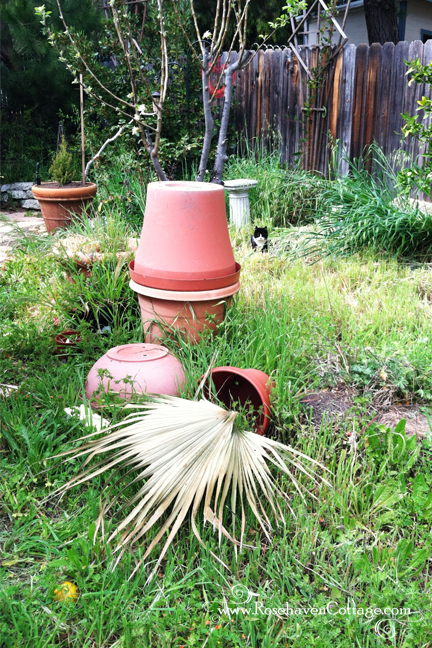 The same day I cut the spring grasses, I also trimmed up the two fan palms. Part of my routine when I trim off the fronds is to cut the fans at the base and toss the thick woody stem in the green waste can. Then I lay the fans out on the ground on top of weeds or grasses that I want to discourage from growing. Over time the palm fronds dry and slowly deterioriate into nutrients for the soil. 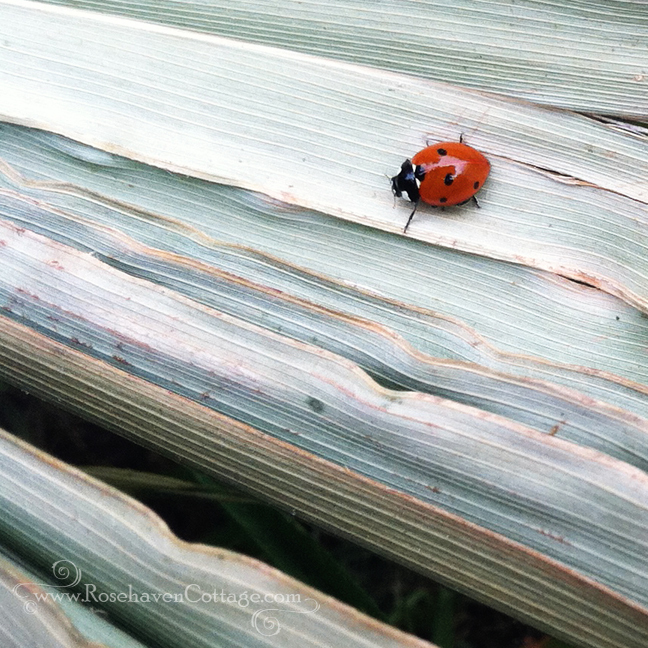 When I was trimming the palms last week, there were a few ladybugs in the palm fronds, but they were more mature ladybugs and I didn't see any larvae so I had to rule out the palms as the place for this year's nursery. Today when I did find it, it was because I'd put one of the palm fans on some of the grass I had cut. The newly-transformed ladybugs and yet-to-transform ladybug larvae were all over the solitary fan frond basking in the spring sunshine. Their hatching spot must have been around the bases of the clumps of spring grass I had cut back. Ladybugs and ladybug larvae eat a lot of aphids. They will choose a nursery location that will have a good food source for when the eggs hatch. Shortly after I stopped using pesticides in my garden was when the ladybugs started showing up and setting up their nursery each year. You'd think since I stopped using pesticides (even spray soaps) that my garden (particularly my roses) would be overrun with aphids, right? Wrong. The opposite has happened. I have less aphids and more ladybugs, ladybug larvae, birds and preying mantis! The aphids I do find on my roses (especially in the spring when the new growth comes out) are quickly gobbled up by a host of predators. I will admit that in order to enjoy this wonderful beneficial miracle I have to let my garden be a little on the shaggy side. Autumn clean-up is minimal too so I don't disturb eggs that have been laid by ladybugs or preying mantis. But for me, the reward is so great, I don't mind. The "natural look" reminds me of the mountain meadows I loved as a child. And I get to marvel at the wonders of nature all over again just like I did back then. Maybe "Shaggy" is the way things are supposed to be. 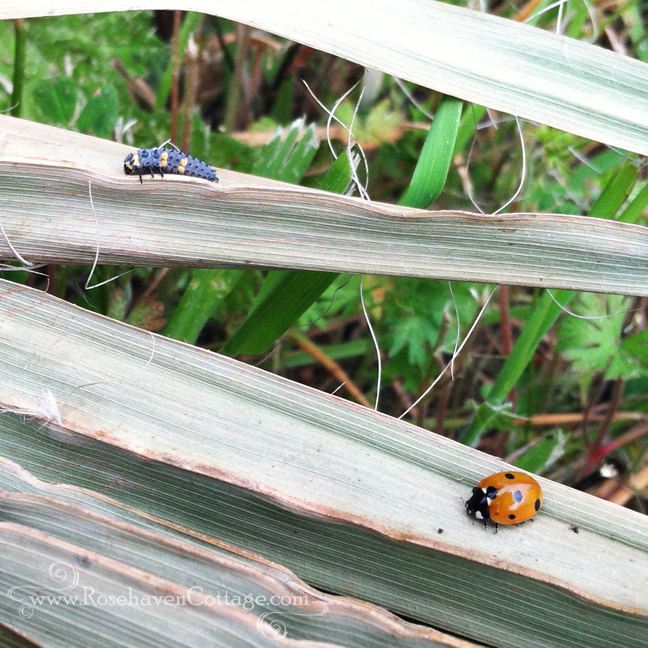 You can bet manicured gardens don't have all the cool things you have... like ladybugs hunts in the spring. I had the same epiphany about insecticides a few years ago. It took a year or so for my garden to equalize, but there haven't been any out-of-control outbreaks since then ... unless one counts Japanese Beetles, which are a short term summer problem that I don't concern myself with. No insecticides at all, not even soap, in the garden. I would never have guessed in a million years that those were ladybug larvae. What a blessing it is to have them set up house in your backyard! Ladybugs are definitely great to have as neighbours. I do love your garden. I don't use pesticides either, and I find the ladybugs in all kinds of places. I do tidy up a bit in the fall, but then I leave some things to winter over. A wonderful post!! That was a wonderful "Ladybug 101" for me. Thanks for all the info and the great photos!